Former Union Minister during the UPA regime, Dipa Das Munshi, lambasted Prime Minister Narendra Modi and his policies of putting at risk the public exchequers in promoting a businessman who is on the threshold of bankruptcy. 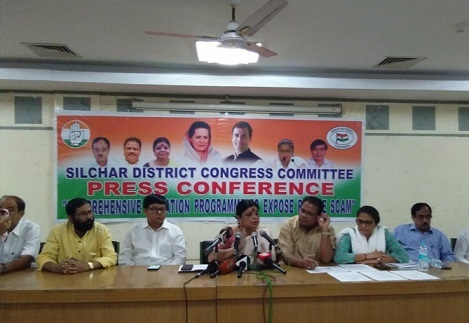 Voicing her concerns at a press meet at Silchar Rajiv Bhavan and as instructed by All India Congress Committee (AICC), Dipa Das Munshi said the purchase of 36 aircrafts at Rs 1,670 crore per aircraft will cost Rs 41,205 crore more than what the UPA dealt with in 2012 with Dassault Aviation for Rs 526 crore per aircraft. “This is the biggest scam of the present government and I would like to bring it before the public for all of them to know,” she said. She came down heavily on PM Modi for bypassing the agreement of Hindustan Aeronautics Limited (HAL) with Dassault Aviation for ‘Off Set Contract’ at Rs 36,000 crores during the UPA regime. In 2015 HAL was sidelined and Reliance Defence Limited of Anil Ambani was awarded Rs 30,000 crore for Defence Off Set Contract and a Life Cycle Contract of 1,00,000 crore. She added, while PM and Defence Minister refuse to divulge the inflated price of 36 Rafale aircrafts claiming ‘secrecy clause’, the agreement between India and France has no such clause on non-disclosure of commercial purchase price as both stands disclosed by Dassault Aviation and Reliance Defence Limited. Reliance Defence Limited was formed on March 28, 2015, just 12 days before the announcement of purchase of 36 Rafale aircrafts by PM Modi in France on April 10 that year, which shows Narendra Modi’s inclination for this corporate establishment. The handing over of ‘Off Set Contract’ in the tune of Rs 30,000 crores to a company with zero experience of manufacturing fighter aircrafts bypassing the PSU’s like HAL with decades of experience is quite perplexing, Dipa Das Munshi said. Dipa Das Munshi was also accompanied on Saturday by APCC President, Ripun Bora, Leader of the Opposition, Debabrata Saikia, All India Mahila Congress President, Sushmita Dev, former minister Ajit Singh and MLA, Rajdeep Goala of Lakhipur.